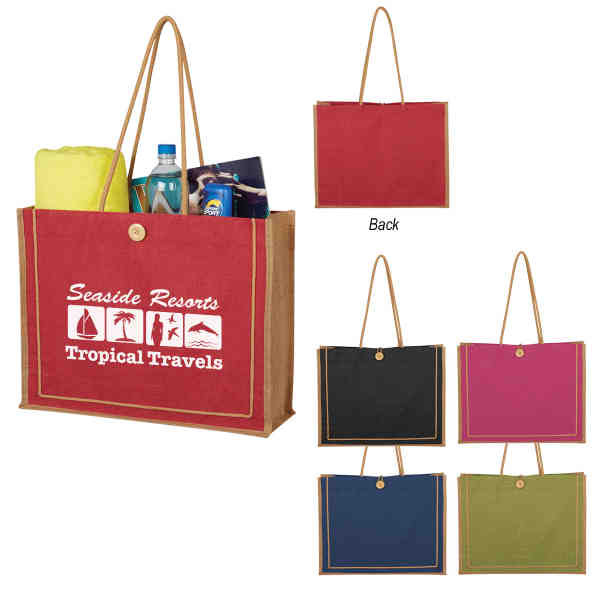 Imprint Method: UNIMPRINTED - Give your customers an environmentally friendly way to shop for groceries with the Paradise Jute tote bag. This handy bag is made from 100% pure natural jute, a natural vegetable fiber, and is available in several colors. It features 25" cotton cord carrying handles and a button loop closure. It is 100% biodegradable and the colors are created with azo-free dye. Spot clean/air dry. Customize with an imprint of your brand logo to make an eco-conscious statement. Size: 17 1/2 " x 14 " x 5 1/2 "